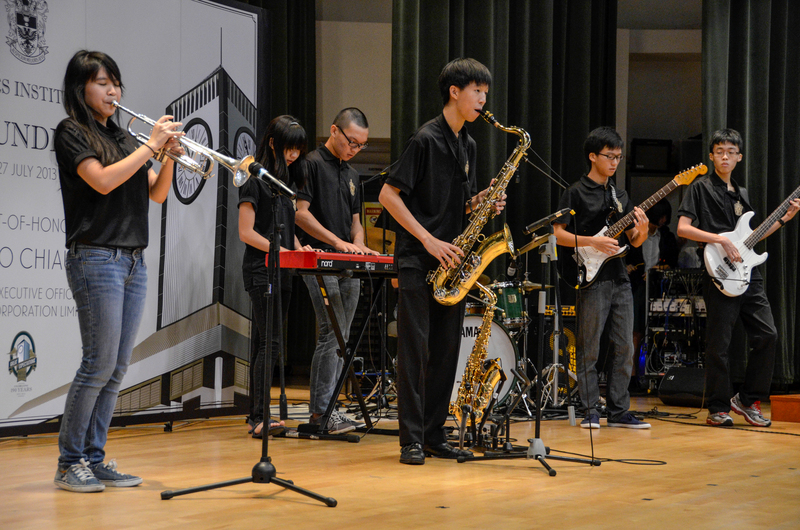 Raffles Institution’s 190th birthday bash was anything but ordinary. Founders’ Day on Saturday, the 27th of July, represented 190 years of history compacted into a ceremony lasting less than 3 hours. The morning ceremony set the stage for the rest of the day’s events, such as the Teacher Time Capsule (part of RI’s Oral History Project, led by Mrs. Cheryl Yap) in the afternoon and the highly exclusive Homecoming Dinner which took place later that night. So, did it live up to the “Great Expectations” of this year’s school theme? For the typical Year 5, attending a 3 hour long prize-presentation ceremony is probably not the best way to start a Saturday morning with rainy weather just perfect for a lazy morning in bed. Yet, a number of students and staff spent last Saturday morning doing just that. Founder’s Day serves to commemorate the milestones made thus far throughout RI’s illustrious history, and remind Rafflesians, past and present, of the school’s rich heritage that we have inherited. The annual event was steeped in ritual and tradition, with an atmosphere of grandeur and history so resplendent it seemed awfully reminiscent of something out of Hogwarts. 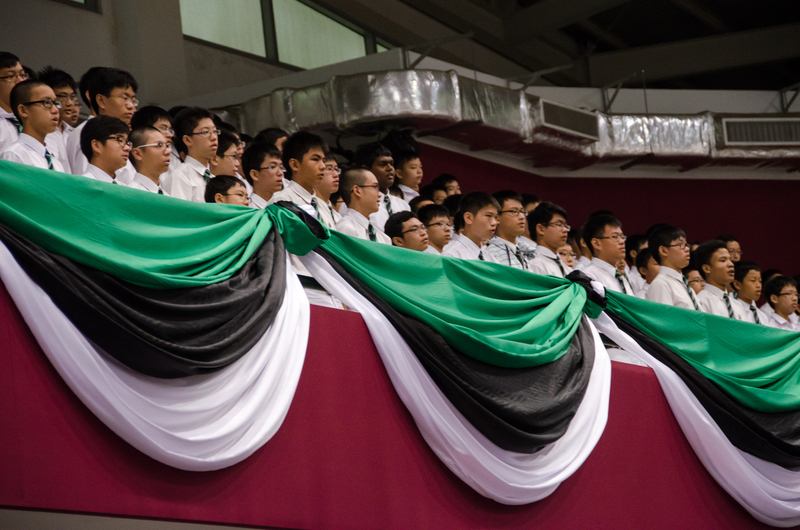 The singing of the specially composed Founders Day’s song, “Rafflesians salute your Alma Mater… Our Alma Mater reigned supreme”. In 2012, out of the 11 student who achieved 9 ‘A’ Level distinctions in academics, 10 were from RI. In the sports arena, Raffles claimed the top position as well. The A division (Year 5 and 6) clinched an impressive 20 golds. The B and C division have each bagged 9 and 7 golds respectively (Note: C division’s competitions have not ended as of the time when this was written). The Wijeysingha Scholarship was awarded to national sailor Jonathan Yeo, who “best manifested the Rafflesian spirit during his first four years in RI”. Jonathan displayed remarkable resilience and fortitude to recover from a serious cycling accident, winning the Schools National Sailing B Division Byte class just five months after the incident which left him wheelchair-bound for a period of time. Many other important awards were also given out during the ceremony, such as the A K Sigamoney Leadership Award (awarded to a Year 6 student leader in recognition of his/her inspirational leadership), which was won by Seah Ern Xu, and the RI Year 1-4 Dux Award (awarded to the head prefect of each year in recognition of his leadership role in the school) to Soh Kuan Wei. For the full list of award recipients, do refer to the 55-page programme booklet, “Honour Roll”. As the award recipients streamed in to thunderous applause and recognitions of excellence, it was easy for one sitting amongst the vast audience to feel small and insignificant compared to the numerous recipients and their long litany of achievements. The grandiose proceedings was a novel experience for some, such as Berenice Low from 14A01D, a JAE student. Comparing her secondary school award ceremony to one that was a Rafflesian affair, Berenice jokingly recalled how “the programme booklet for [her secondary school’s] Speech Day was always printed with white paper like the Learning Journey worksheets”. Yet, the archaic and staunchly traditional atmosphere projected might have made it a little less relatable for the average student, compared to say the Founder’s Day in our sister school, RGS. 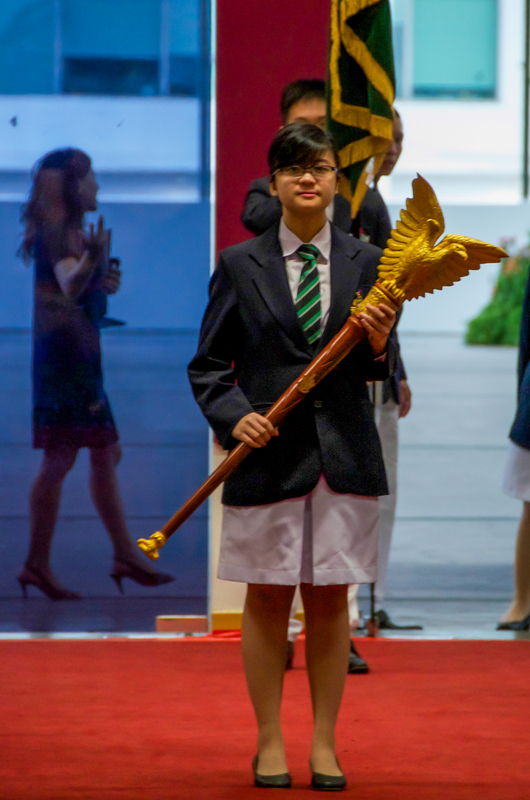 As the outgoing Student Council President, Ashlynna Ng, puts it, “In RGS, Founder’s Day is quite a big thing, and everyone gets really excited about it. For example, when we celebrated 130 years [of history]. Back in RGS, it was really more of an entire school coming together to celebrate Founder’s Day.” One wonders then if the formality and decorum of the ceremony might have alienated some of the crowd it sought to make more bonded to the school. Does that make the Speech-Day-alike Founder’s Day in RI nothing more than a purposeful show of fanfare? This writer is not so cynical. No doubt, when Mrs Lim took the stage to announce a series of eye-popping facts from the Institution Report, her audience — students, parents, alumni, donors alike — was quietly impressed by the things that Rafflesians were and are capable of doing. It occurred to the writer, at numerous times throughout the ceremony, the loneliness a humble individual could feel within the orbit of over-achievers. But it is precisely the fact that Founder’s Day instills in every Rafflesian, past and present, a strong sense of pride, a sense of belonging to a wider community, that makes it special. It is worth clapping for the seniors and schoolmates that laid the basis for us to be regarded as the elite population by all. It is worth celebrating the fact that we are the authors who pin down the 191th year of history and beyond. It is worth mouthing the words of the Founder’s Day song, “A name that’s stood the test of time/ For a hundred and ninety years of history”, if just to soak in the brief moment of camaraderie as part of Team Raffles. Auspicium Melioris Aevi, Happy Founder’s Day!